Nathan P. Gilmour , 12 February 2015. Wittgenstein, in this session’s readings concerns himself with relationships between our general terms and the ranges of realities to which they relate. Once again in his sights seem to be philosophies of language that treat “pure” language as a desirable (even if impossible) outcome and regard as defective philosophies of language that either optimistically suggest a theory that will govern all “pure” language or nihilistically say that, since no such rules seem to govern language, that language must be an utterly random cluster of phenomena, not subject to any sort of judgment. Such is the tension between events, embedded as they are within particular forms of life, and explanations for those events after the fact: when they’re in the process of doing work, words and phrases don’t present any particular philosophical problem, yet they slip out of our grasp whenever we try to conceptualize them. Likewise with the sentence “Now I can go on” (179). When we learn a mathematical formula that generates a sequence (think the sequence of odd numbers), Wittgenstein wants to know what we mean when, after generating 1,3,5,7, and 9, we say “I can go on from there.” Certainly nobody has every odd number in mind, all at once, but also someone who could go out to 17 but not to 19 doesn’t really have the ability to “go on,” right? Thus the concept of having a formula “present” in one’s mind is nowhere as simple, when we try to explain it, as the task of counting odd numbers is (184). The upshot of the thought-experiment is that, at every point in the sequence, the person who “can go on” must make a decision about how to proceed (186), thus making the notion of “knowing the sequence” at best an imprecise shorthand. Yet we continue to teach math students how to use formulas, and few of them have the sort of trouble using the formula that we have saying what it means for a formula to determine a sequence (190). I should pause here and note what I’ve realized about Philosophical Investigations this time around (my third time reading the book but the first when I could articulate this): looking for a single thesis to the book misses the point entirely. Likewise treating it as a repudiation of all “rules” and systems governing language doesn’t really understand what’s going on. Instead, the book leads readers (and interlocutors, if we read it together, as we’ve been doing at Emmanuel) through a series of linguistic quests, where we struggle against philosophical difficulties, not with the mindset that we fail if they remain unsolved but perfectly aware that, as we wrestle with them, we’ll become aware, at least when we’re paying attention, of the places in which both the history of philosophy and so-called common sense neglect the real character of our existence as language-using beings. 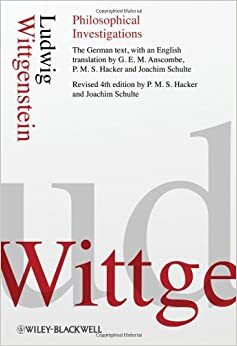 But back to the book: Wittgenstein returns again and again to the tension between language as doing work within most forms of life and language when the form of life is itself doing-philosophy. The sense I get is that Wittgenstein doesn’t want to say that philosophy isn’t a valid form of life so much as to say that philosophy, when we remember that we are a form of life and not hovering above all possible forms of life, has its own way of following our own “customs” (198). Language is always part of a life, and with that in mind Wittgenstein reminds us thus: “To understand a sentence means to understand a language. To understand a language means to have mastered a technique” (199). To relay meaning might be one task for which we develop techniques, but others might likely be more numerous. Thus Wittgenstein connects the philosophical problems surrounding rules to those connected to languages as techniques. Because every language stands as a technique for some kind of living, Wittgenstein suggests that interpretation of rules, as a life-practice, means to substitute one expression of a rule for another (201). Ways of following a rule include interpretation, but not every relationship to a rule involves that act. Both “following a rule” and “not following a rule” are primarily public things, unlike thinking that one is following a rule (202). The triangle occurs again: we can name easily enough moments when folks follow and do not follow a given rule, just as we can name moments when we or other folks have had to interpret rules. The mistake, Wittgenstein reminds us, happens when we make the claim that every relationship to a rule is an interpretation. To do so ignores the reality that “interpretation” is not a state of being, always, but sometimes something that one does in this moment when one wasn’t doing so in that one. I reckon that’s as good a place to end a Wittgenstein session: a reminder, by reduction to absurdity, of the ways in which our languages work perfectly fine, often without any reflection, yet when we try to articulate rules that govern that language (prescriptively or descriptively, lest anyone fall back on that old binary), language’s structures elude us. Yet we know full well that, in those cases on the margins, when we must resolve conflict that involves words, that’s precisely what we must do. Such is the life of language-using beings. And such is the joy of reading Wittgenstein.